"Les and I met over 18 years ago when we were both first-years at the University of Virginia. Over the years, our paths continued to cross including overlapping at Harvard Business School and walking down the aisle together at a mutual friend’s wedding. I like to remind everyone that we were ‘friends’ but not ‘close friends’- Les wasn’t even in my phone! It wasn’t until January, 2013 when things changed. Les somehow found out I was going to be in town and invited me to attend an Obama inauguration party in Washington D.C. and till this day, claims that that was the night he realized that I had grown up and was no longer the “18-year-old” version of myself. So he worked his charm and started setting up yoga dates with me. Unfortunately, due to many snow storms, including NEMO, those dates kept getting rescheduled. The good news is that we realized over the phone that we had so much in common and enjoyed each other’s company (even virtually). Finally, on February 13, 2013, we had our first date and never looked back!" "We met back in 2004 at Garba. Amar introduced himself to me, we shook hands and went our separate ways. Five years later, he found me on Facebook and sent me a friend request. Facebook chat turned into long AIM conversations, then text messages, and soon thereafter led to late night phone calls until 4AM every night. We survived 2.5 years of long distance, courtesy of FaceTime and Southwest Airlines and couldn’t be more excited to finally get married in beautiful Santa Barbara, CA!" "Our paths crossed in college at the University of Southern California. I was always buried in books, studying hard to be a Neuroscience / Pre-Med major. Sei was busy competing internationally in business competitions, socializing with his fraternity brothers, and leading USC’s Bhangra team. I eventually took a chance and joined the Greek System my sophomore year. On one of my first days as a newly initiated TriDelt, Sei tried to sell me his fraternity’s T-shirt but really just wanted me to join him in a salsa dancing event (I am in no way a dancer, but I somehow agreed). While we never “officially” dated until six years later, we always knew we shared something special and so did our mutual friends who “purposely” brought us to the same bar those six year later - the rest, as they say, is history!" "Well, I met him in the summer… of 2014, Hirsh had relocated to Philadelphia for Johnson & Johnson and I had just matched for my first year of residency training also in the City of Brotherly Love. Through a mutual friend's invitation, Hirsh wound up at my housewarming party where I apparently claimed to find him “tolerable” (which he somehow took to mean that I was ‘head over heels’ for him). So he went for it! From happy hour at Sampan to Rutgers football games, the two of us became inseparable. Somehow between my 20-hour shifts at the hospital and his interviews around the country for business school, he managed to surprise my family and me in our annual family ritual - the Rock n’ Roll 10K race in Phoenix. That’s when I knew- we’d be running a wild race together for years to come!" "We met through friends one freezing winter evening - Not yet an East side convert, I vetoed his Murray Hill lounge suggestion for Above 6 in Columbus Circle, and he was on board (flexibility, check). We bonded over lychee martinis during an epic 8 hour first date where we befriended a Vietnam veteran who thought we were engaged and gave us a scratch & win card to scratch off at our wedding (which Niren unfortunately lost) and a lucky $2 bill (which we still have!). We ended our night with obligatory late night eats and a 90s music sing along. Though neither of us would admit it at the time, we both knew on our first date that the Vet was onto something!" "While we went to undergrad together, we weren’t very close until years late. We both lived in New York and a mutual friend of ours invited me to one of Daniel’s house parties. In return, I invited him to a dinner party. As a surgical resident, my life was crazy but he became friends with my sister so we naturally spent more time together. After becoming the best of friends over the next year, we finally started dating-- four and a half months later, he proposed to me on the beach in Curacao!" "We both were students at UCI and crossed each other’s paths several times, but never actually 'met' each other properly. I guess having caught Avi’s attention one of these times, he asked our common friends about me. While Avi was nervous about making it known that he liked me, his friends were just the opposite- they took any chance they got to talk him up and tell me how great we’d be together. So finally, an introduction (or two or three later), followed by a Facebook message, and a week long competitive themed party strategized to make Avi my team’s 'captain', our love story began! 6 years of dating- we shared amazing experiences and adventures together, but also went through some of life's greatest hardships. We realized we were the best versions of ourselves when we had each other by our side which led to an engagement, marriage, and a new life together in Washington D.C.!" "We always tell people that we had met during a pediatric charity fun run, and our hands first touched when helping a child. However, that is not remotely close to the truth. The reality is that we met during residency orientation. Neil looked over at Aarti during ice breakers and thought she was gorgeous. She looked over at him and thought he was lost. Since Neil is part of the pediatric neurology program, he wasn't included on the roster of the new pediatric residency class. Aarti approached him following the ice breakers with a mixture of pity and kindness on her face in an attempt to determine whether he had shown up to the wrong city. At least it got them talking, and the rest as they say, is history." "It all started 11 years ago! We met at a mutual family friend's house for a 13th birthday party (my sister had just started rooming with his really good family friend and her younger sister was turning 13. He was obviously there because they are such good friends and her family invited mine over for the first time. He walked into the house and our eyes locked instantly -- you could say the rest is history :) But really that led to him trying to figure out who I was all night long, then getting my AIM screen name and chatting me up for a few months before I accepted his invite to be his prom date later that year. Shortly after, we were officially dating and 11 years later we are almost getting married!" "Parth caught Puja’s eye one night as he skateboarded down the dimly lit pathways of the UC Irvine Campus. He was shy, and a little oblivious. They reconnected at a retreat where Parth surprisingly found himself playing camp games—amused by Puja and her bubbly personality. As opposite as they are, something unique, and something special has kept these two together—across time zones and across many barriers. They have celebrated many achievements, and the biggest one is yet to come— 9 years in the making! Their commitment to one another proves that long distance may be hard, but very well worth it for the right person." "We met online, on Tinder! I was living in NYC at the time, and flew to San Francisco for business where I swiped with Gurjit. We met for 4 consecutive nights whilst I was there for work and just hit it off. I flew back on the Friday then a month later for July 4th, we decided to meet half way in Austin TX - that is when we both just knew that this was it. We did long distance NYC and SF for 2 months, when I decided to leave my job in NYC and move to SF. Within 4 months, we were living together in SF. 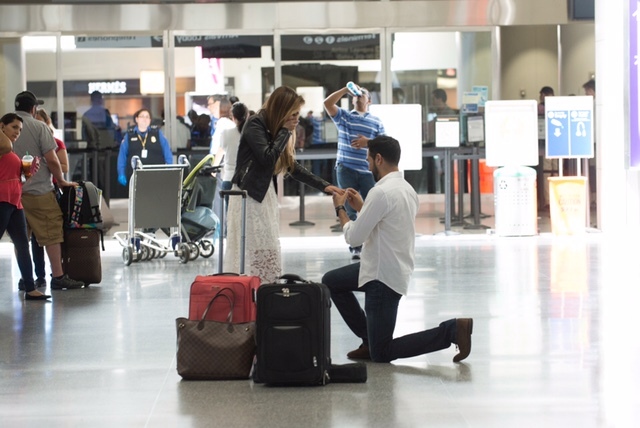 A year later, Gurjit proposed to me at SFO right before a Euro trip we had planned. 6 months after that, we both relocated to Amsterdam, Netherlands. And now, this year we are getting married."